One evening in Tennessee, several of us went to Morton Overlook for sundown. The clouds so reminded me of a Georgia O'Keefe painting, I exclaimed they are Georgia O'Keefe clouds! 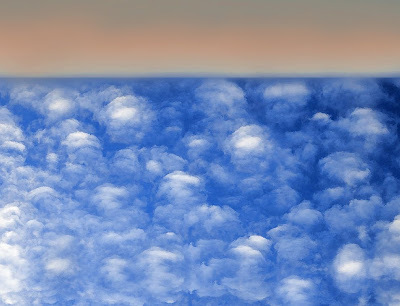 Tonight I decided to see if I could work two images to emulate the image I had in my mind of the O'Keefe paintings, Sky Above Clouds. O’Keeffe worked almost until the very end of her long life. In her 70s, she took her first trip by airplane. 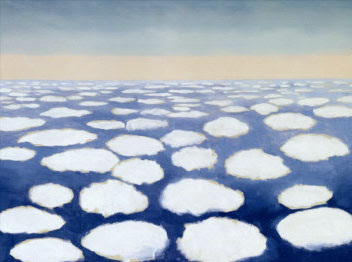 From 30,000 feet, she was inspired by the extraordinary view of the clouds below her and later produced Sky Above Clouds IV, the largest painting of her career. To make the work, she stretched the huge canvas across the outside of her garage, painting from dawn until the last light of the sun dimmed at night. To reach the top of the canvas, she climbed a ladder and for each of the lower levels, she stood or sat on a special platform: a table, a box, a small Mexican chair, and finally, the floor. Never would I even think this image compares to the painting but the idea is that artists impact artists! and we are still amazed and enchanted with the essence and beauty of our planet.